The character of a political centre can hardly be analysed without taking its hinterlands into account. A centre is defined through its relations with other powerful actors/polities outside its own territories, but even more important to this definition is the centre's relationship with its own local networks. This is, especially true when dealing with pre-modem and/or early modem political systems such as the Ottoman empire. 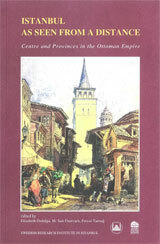 During the Ottoman period, global or international relationships had not the depth they have today. The image of a centre depends on the theoretical perspectives and/or concepts being used. In his classical article on centre-periphery relations in a Turkish context, Serif Mardin contrasted centre-periphery relations in the Ottoman empire with those of traditional Iran, on one hand, and with those of the modem nation state in the West, on the other. As against the Iranian rulers, who were often merely "grand manipulators", the methods used by the Ottomans were more "ingenious and varied".